We should not dismiss immigration concern at a national level, even if people’s experience of immigration at a local level is limited, explains British Future’s Sunder Katwala in the new report State of the Nation: Where is bittersweet Britain heading? People worry more about immigration as a national than local issue. In the State of the Nation poll for this report, 19% choose it as a top local concern, while 30% placed immigration first when thinking about tensions facing British society as a whole. The point is underlined by how little the distribution of concerns about immigration as a local issue reflects the distribution of immigrants across Britain. Immigration was a top source of local tension for 19% of people in the north-east and 20% in Wales – where the 2011 census shows one in twenty people were born abroad – and for 20% of Londoners, where immigrants make up more than one in three of the population. There was distinctively more concern about local tensions in the east of England (31%; 11% foreign-born) but similar immigration levels evoked less concern in the south-east (17%) and West Midlands (24%). There was a remarkably similar pattern of attitudes across the country, with immigration cited as a top concern by between 17% and 20% in six of the nine English regions, though concern was lower in the south-west (8%). Immigration levels differ rather more across the regions than immigration concerns do. This suggests that there are limits to how far immigration anxiety can be addressed 20 through a focus on practical responses to local pressures, such as on housing, schools and surgeries. Those responses matter in their 15 own right; they may be an important antidote to prevent anxiety accelerating. But they may also often be the occasion as much as the 10 cause of immigration anxieties. 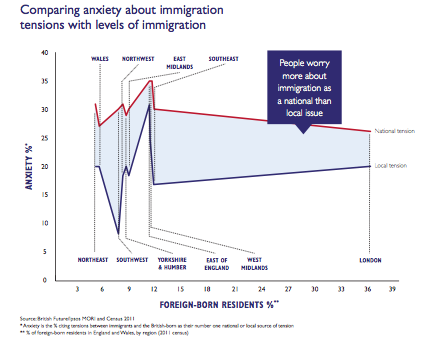 The local-national gap may lead some to suggest that immigration anxiety is more about ‘perception’ than ‘reality’. This does reflect the profile and dominance of negative narratives about migration in political and media discourse. Readers of tabloid (25% local; 35% national) and mid-market (22%/35%) newspapers were more likely to cite immigration as their top source of local and national tensions than broadsheet readers (13%/22%). But it would be a mistake to regard “national” perceptions as imaginary and local perceptions as “real”. Immigration anxiety involves a broadly equal mix of economic and cultural concerns. If a sense of national identity and social cohesion matters – and most people think that it does – then this, ultimately, is about a subjective perception of national well-being. The regional pattern also suggests that immigration anxiety often reflects general economic insecurity more closely than the local scale of immigration. Immigration is more visible than changes in technology and trade – but suggesting the anxiety would be better relocated to broader globalising forces will not get anybody very far. Policy-makers, whose Treasury models show immigration contributing to growth and economic recovery, need to persuade a public which is sceptical about this. Broader agendas for growth, jobs and opportunity would do more than seeking to fact-check public perceptions about correlations or causations between immigration and the availability of jobs. That will often be received as dismissing public concerns as wrong-headed, and that usually only persuades those already onside.